It is time of spring-coming. As the spring season is full of celebration with high spirits in India, the start of making merriment has begun with celebration of Holi - The Festival of Colours. The belief attached with celebration of Holi by Hindu is that the Lord Sri Krishna liked to play with beloved devotees with coloured power (Golal or Faku) in this season (in the month of Phagun or Phalgun). With that angle of belief, Holi is celebrated all over India in the time of full-moon falls in the month of Phagun or Phalgun (mid of March). 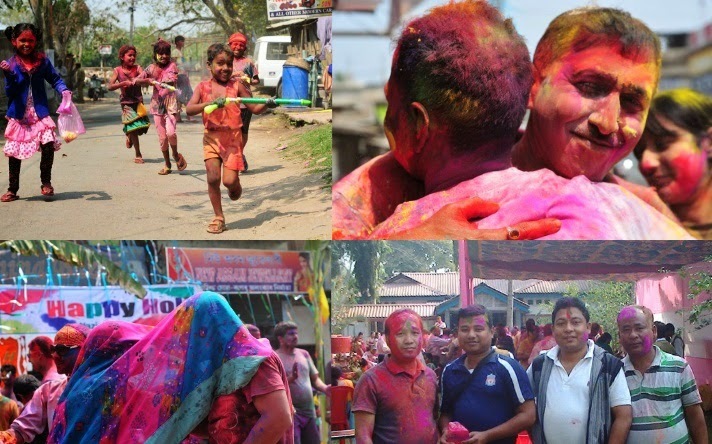 In Assam the Festival of Colours, Holi is called as Fakua or Doul Utsav or Doul Yatra. The common belief is that the celebration of this festival in Assam was initiated by Mahapurush Srimanta Sankardeva after returning from pilgrimage, adding new dimension to ‘Bhakti’ movement. Oil and Natural Gas Corporation Limited (ONGC) is the most valuable public enterprise in India engaged in the field of exploration and production of oil and natural gas. The operational area of ONGC in Assam primarily covers with the districts of Sivasagar, Jorhat, Golaghat, Cachar, etc. It is as a national enterprise, employees of ONGC from different places of India with diverse cultural traits use to stay at Nazira, but maintaining unity in diversity, Holi has been celebrated in ONGC premises, Nazira with high spirits with two-day events including Holika dahan and playing with colours on 16 & 17 March, 2014. This festival has been celebrating in Barpeta Satra since long time according to the tradition of the Satra. 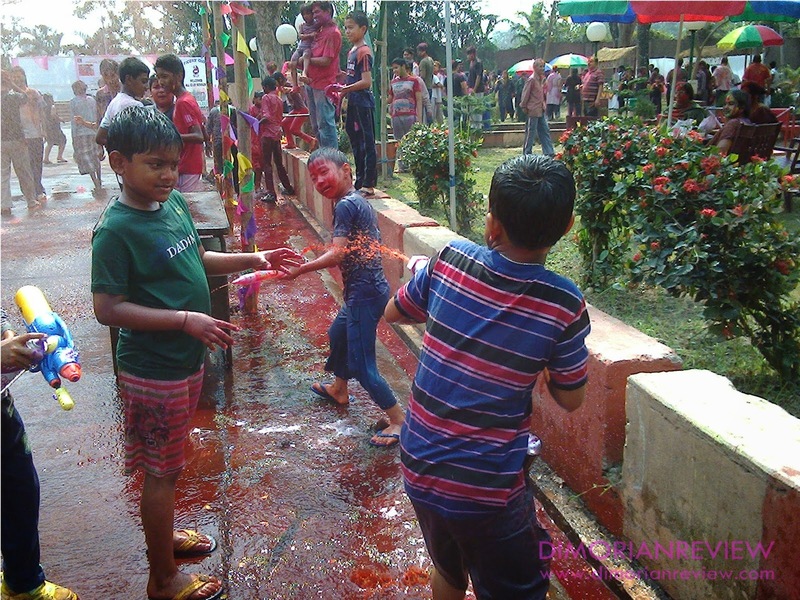 Holi Gandha is celebrated on the eve of the festival. In front of the math (Temple) in the courtyard, an idol of Lord Sri Krishna is worshiped by the head of priests. After this ritual over, the priests bring the Idol to a specified Doul and the idol stays there for three days. On the beginning of Hasta Nakshatra, countless devotees throng to the specified place (Doul) with high spirits of merriment. 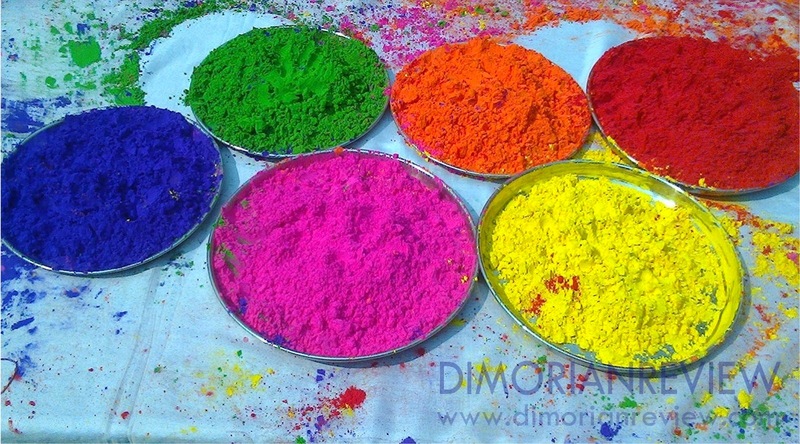 People play with Golal or Phaku or Fakua (colour powder). The area turns to be colourful with the enthusiasm of enjoyment and ‘Bhakti’ to Lord Sri Krishna. Devotees play with colours and together, sing Holi songs beating drums, ‘Khol’ and other traditional musical instruments. Such a way, maintaining the tradition, the idol of the Lord Sri Krishna approaches the gate of of the ‘Kirtan Ghar’ and the door keeper of ‘Lakshmi Devi’ closes the gate obstructing strongly to come inside to Lord Sri Krishna. A representative of Lord Sri Krishna promises that He will never go to anywhere leaving ‘Lakshmi Devi’ alone.